My idea of making a major decision while on vacation is thinking about the best position of my beach chair . Should it be upright for writing or reading, midway for relaxing or all the way down for serious tanning or snoozing? The perfect beach chair-for instance, one crafted from teak with an attached table. ..a step away from the pool with padding as thick as my mattress and a soft cotton cover to prevent unwanted sliding or sticking--can recline to any position including my favorite one called, "George Clooney Take Me!" As usual, my brother and his family arrived on the scene, outfitted with beach equipment from aisle four of Wal-Mart...enough equipment to start a YMCA camp. I pointed towards the people sitting at the edge of the water and said, "Look, Serious Beach Chair People." My sister-in-law smiled and immediately moved all the beach chairs down closer to the waves As we sat there, the waves gently lapped over our feet. I turned to my sister-in-law and niece and said, "Who needs a manicure, a massage or a therapist? 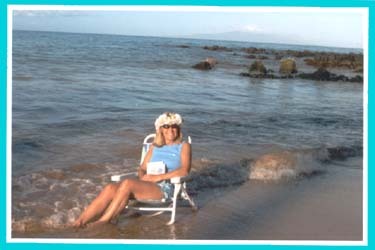 I just need beach chair therapy!"